Saturday is our day to feature hybrids and today, we've got a great one. 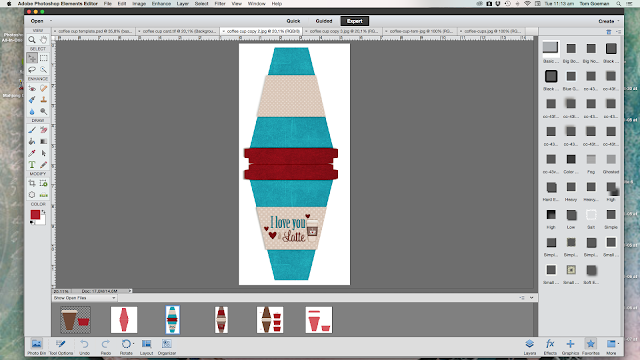 One of my biggest issues as a digital scrapper is getting my designs from the screen, into my hands. I'm finding it a bit unfulfilling keeping everything on the screen. We've got a great solution for that. It's free, fast and really easy. What more could you ask for? So keep reading to find out how you can use February's Cute Cards to create a mini album for your Valentine, for you or someone special. If you are wanting the png version of these cards, click here. You could use them digitally, like we did here on this digital layout. We're even providing you with the free quick page. All you have to do is plug in your photos. You could just print this out in a 4x4, 6x6 or 8x8 format. Or you could make a mini. See how we made two different minis with the Cute Cards. First, download the Cute Cards and print them out. Make sure they are the size you want. Print out the pictures you would like to use for on the back of the pages/cards and adhere them to the opposite side of the Cute Cards. You could use some scrap papers and layer them up if you choose. For my frist mini, for JJ, my youngest, I kept his book very simple. 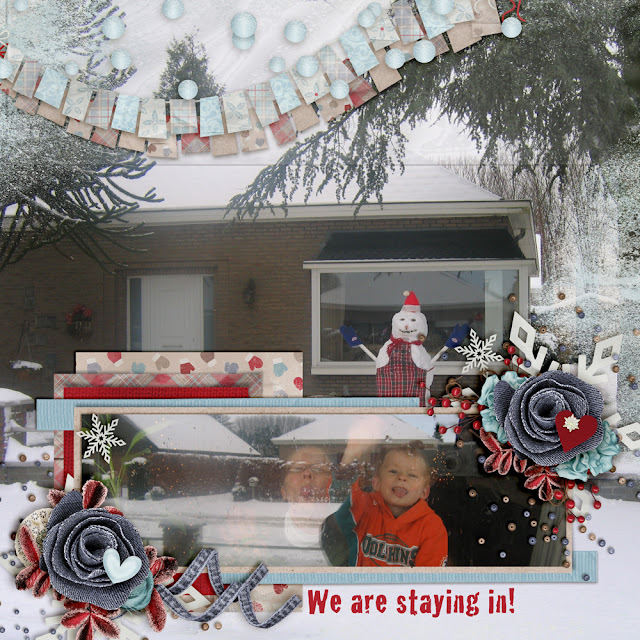 I used a heavier weight paper for the Cute Cards to make it more rigid, cut out the photos, through the years, that I thought he'd like the best, rounded the corners of the pictures and applied the photos to the back of my Cute Cards. Then punched the holes in the top left corner and added the coordinating, blue brad. His favourite colour. This mini was seriously whipped up in 17 minutes from start to finish. You could also laminate your pages if you choose. For my oldest's I wanted to try my ribbon method that I considered in our custom planner. It looks so pretty when you use a wider ribbon. You can check that out, here. Here's how I did Liam's album. I punched two holes, evenly separated on each Cute Card. I got the first one how I wanted it and then used it as a template for the next and so forth. I recommend not using the same one over and over again or the holes will be a bit wider then the rest of the other pages. You can see how I layered up my papers on these cards for Liam's album. Find some coordinating string, cord or ribbon for your binding. I chose this lovely bright red string that wasn't too wide. My holes are pretty small. Thread through your holes on each page. So you end up like pictured, below. The next step is bring the ribbon, string or whatever you are using through the next set of holes. Look at our illustration. You can choose to have the tying of the bow on the front or the back of your mini. I went for the front and just tied these ends into nice bow. You could embellish further is you like. Keep the string just a bit loose and the pages will turn easily. See! I used pics from when they were really small, a bit bigger, bigger and then most recent. I had Liam choose the photos he liked best from a pool of choices. Voila! Two mini's made very easily and with the stash you have, saving you money. Doesn't cut at all. Not even on better paper. If you've got a better solution besides buying a new punch, let's hear it. If you're digging the colours of our free February goodies, you may be interested in this mini we are offering on our Facebook Page. Make a comment on the right status and we'll send you the link. Sorry, you missed out on this one! Sign up for the newsletter so you don't miss the awesome free stuff. This is our most recent freebie. 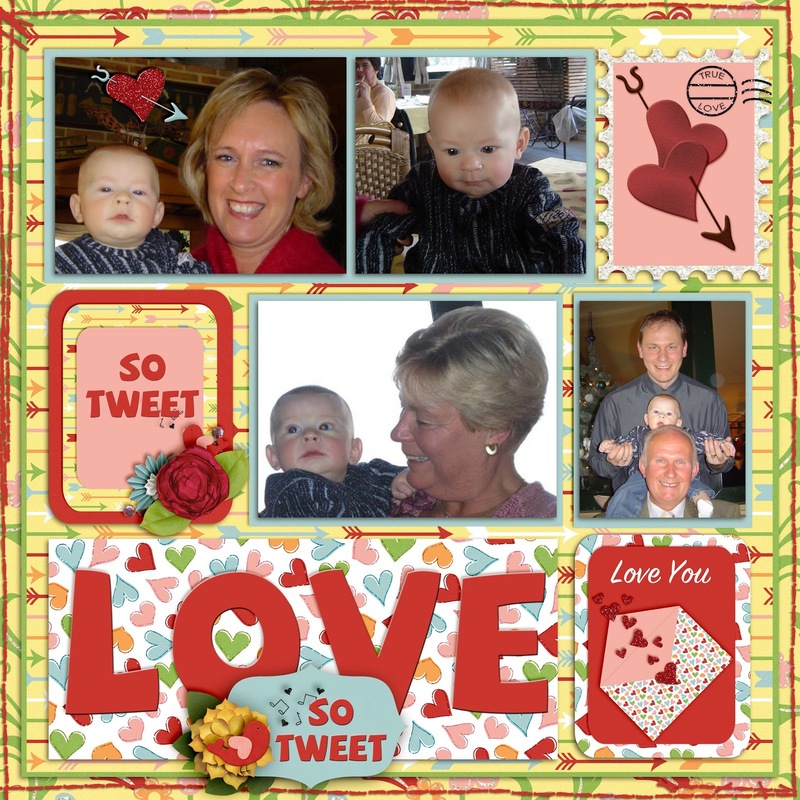 It's a free, cluster frame template. Click on the image to get it. That's our hybrid for you, today. Love hybrids? 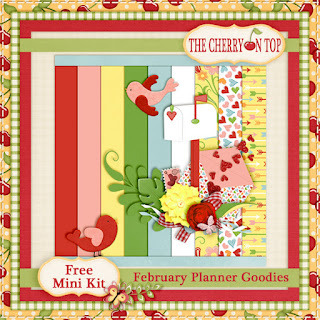 Check out our two before this or look at our Pinterest board, The Cherry On Top's Freebies and find them all in one convenient place. We do have a search option, to the top right of the blog is you like. These lovely free printable tea envelopes. 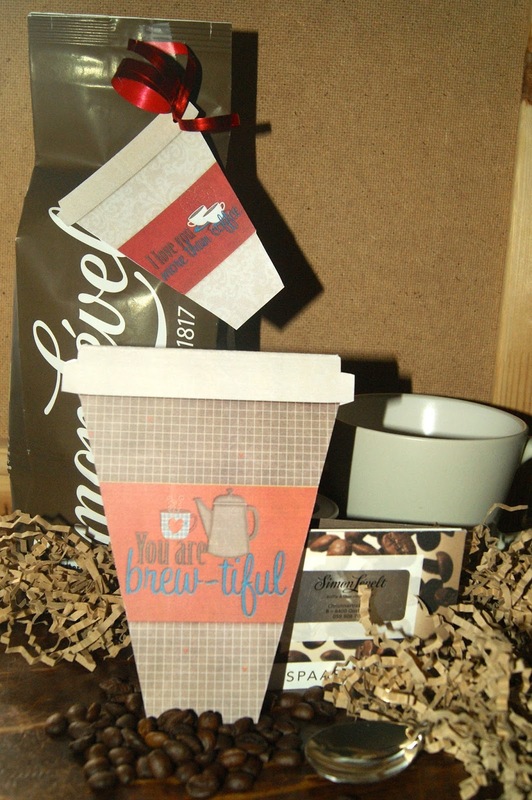 Coffee cup tags and card with gift card pocket. Enjoy our Personal Use ONLY freebies. Happy scrapping and thanks for hanging with The Cherry! Welcome to another huge, fantastically awesome, scrappy edition of The Cherry On Top. We are totally kik'n it, today with scrappy inspiration, TWO hybrid projects, a couple of tutorials and a freebie, of course. Here's a peek at the hybrid card. 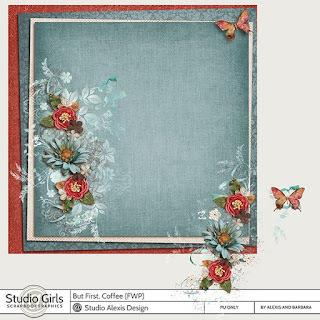 Amanda has a template in her collection that you can use to make it and I've got the tutorial and some photos on just how to do it. It's really, really easy and won't take you long at all. This is the template I designed and the examples I made. If you don't see Amanda's in the shop yet, they will be there soon. Here is a look at the collection. Isn't it super awesome?! There's a shot of the tags. You can purchase the tags already designed, by yours truly or you can grab the template and design them to your very own style. You can also use that very template to design your card. Keep scrolling to find out how. Here's a look at all three tags. Simply print and cut. Punch a small hole left, right or centre if you like and add some coordinating ribbon. Think about glitter glue for some added bling, like I did on the tag to the right. Tip: To get that effect on the tag with the heart, all I did was put a blob of glitter glue on the inside of the heart and used an end from a paper clip to spread it in just the right shape I needed. It looks really cool and 3 dimensional. This is what your template will look like when you open it up. Design your very own tags like I did above, with Amanda's lovely, I Love You A Latte kit. I simply inserted the papers and used the word art over the cozy. So easy and literally made in minutes. These tags measure 5 inches. If you want them bigger or smaller double check and make your adjustments before printing. 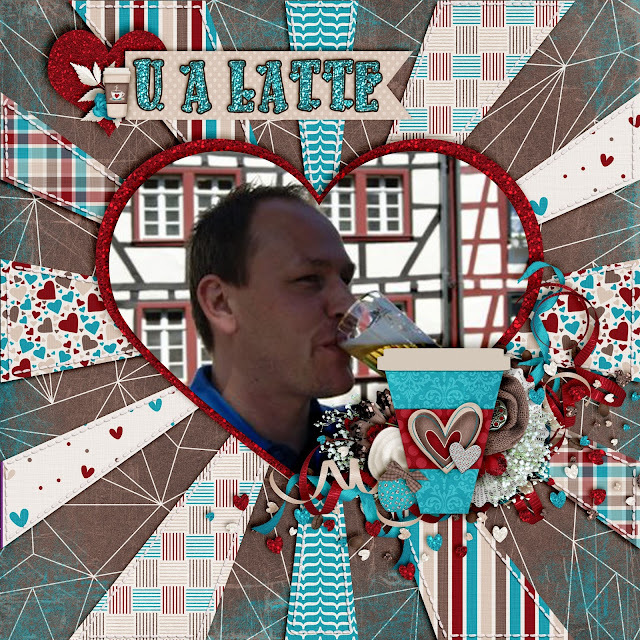 If you want to make the card like I did above, get your template from above ready, with the layers on the side in view and copy what I did here. 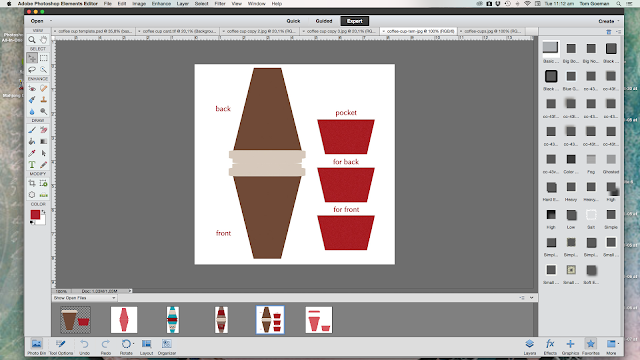 Click on the layers of the template that make the cup. Do this BEFORE you insert your papers. Duplicate or copy those layers, then invert the layers and drag them to the top of your original template like shown below. You may have to click on all 6 layers (both cups) and shrink them up a bit to fit on your screen. 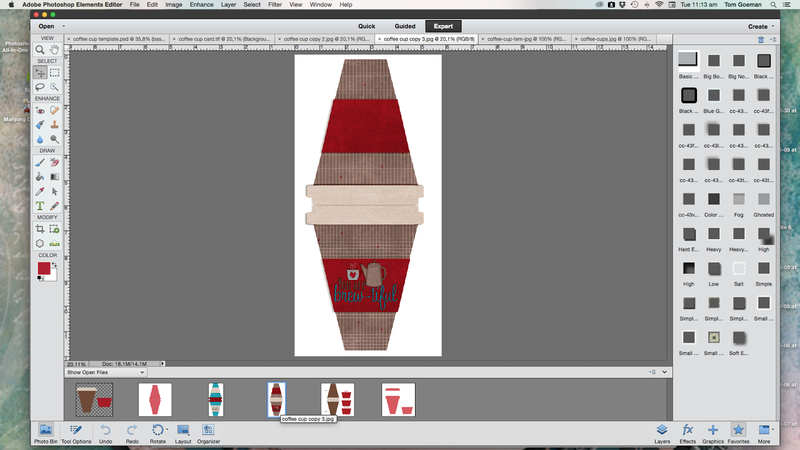 Do a test to make sure the cozy still fits nicely on your cup then make 2 more copies of it. One will be for the front, one for the back of your card (if you even want it) and one if you want to make a pocket for the inside of your card. 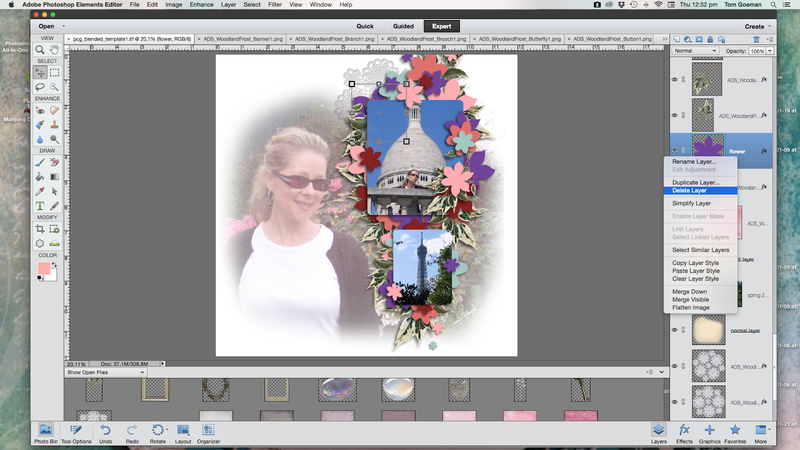 Here's what the card will look like after you insert all of your desired backgrounds and Amanda's word art. I thought this one had a bit of a masculine, warm touch to it. Mix and match your papers and use your favourite designers word art from this mega collection or design your own. All you'll have to do is print, cut and fold in half and you're set. If you want the pocket, you'll have to print it, cut it and glue three sides only and position it on your card. 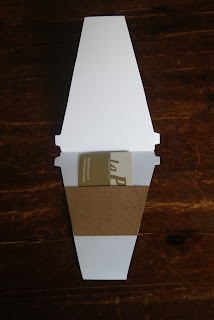 You can also use some scrap card stock if you prefer. (That's what I did.) Keep the size of whatever it is you want to insert into the pocket, in mind. *This template is just large enough to hold a credit card sized object, placed the long way. You also might decide to use your card, after printing, as a template, trace around it over some coordinating card stock to line the inside of your card. Here's what it looks like from the inside with something tucked in the pocket. If the pocket isn't fitting perfectly, make your own by tracing on some paper, cutting and gluing in place. 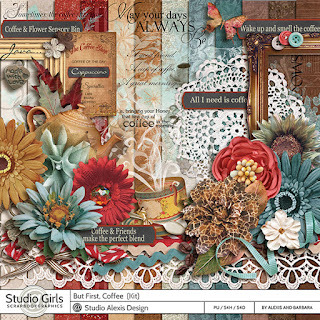 The talented designers at the Studio have several kits and or collections in this gorgeous mega. I've had the honour to play with four of them. Check out some scrappy inspiration from The Cherry. 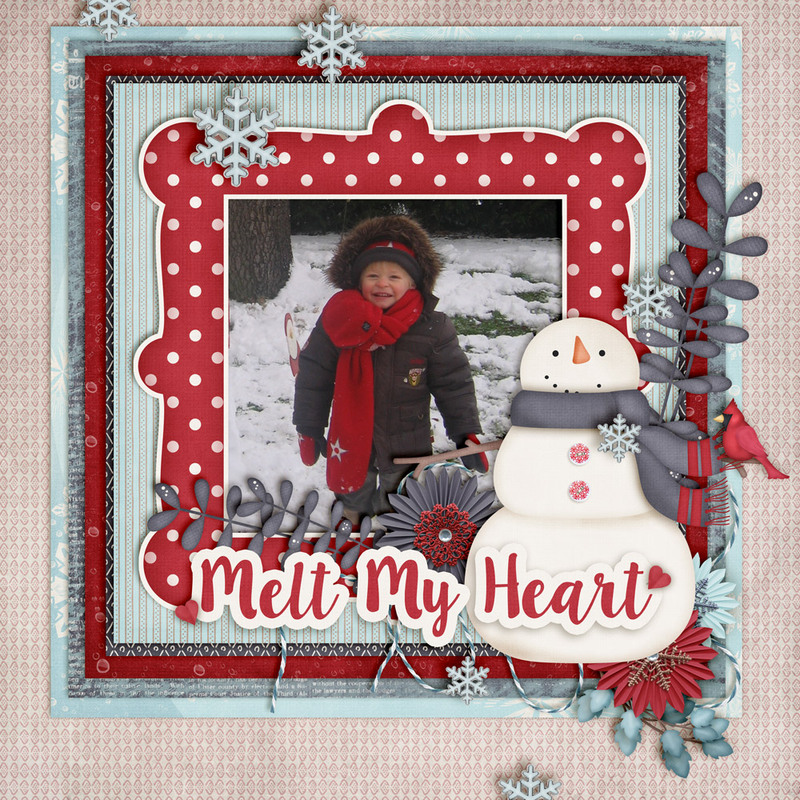 This lovely layered up layout uses A-Manda Creation's collection, I Love You A Latte. I decided to leave the blue out of this one and came up with a soft, elegant and very warm design. 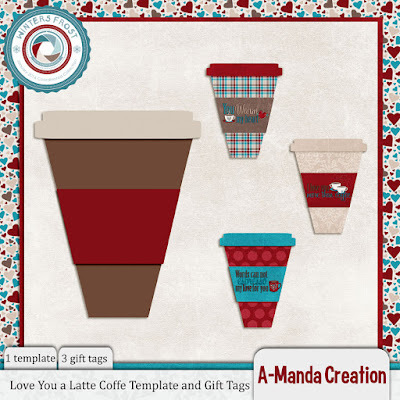 Here's a layout with Amanda's collection, an older template from Lissy Kay Designs and I used the template from Amanda's collection to scrap up the large cup in the cluster. 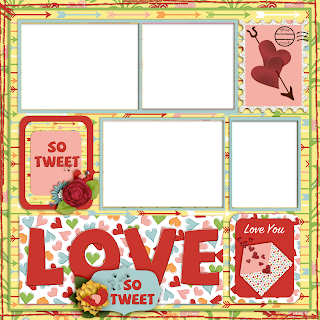 So you can use that template to make tags, cards and use it in digital or traditional scrap pages. Ya gotta love that kind of versatility. This layout show's off two designers creations. A fantastic collection, Winter's Frost from Aimee Harrison Designs and an awesome template from Heartstrings Scrap Art that's also a part of the Studio's super collection. 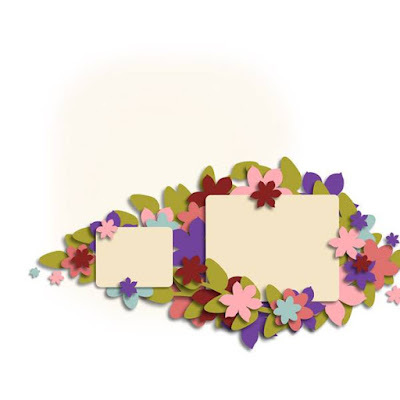 Heartstrings Scrap Art sure does have some gorgeous templates. Here's another one of Byrony's templates from the Winter's Frost mega collection at the Studio. This time I paired it up with The Kit Cart Designs collection. The Kit Cart also has layered papers in the Winter's Frost collection. If you don't have a lot of time to scrap, then these layered papers are ideal. 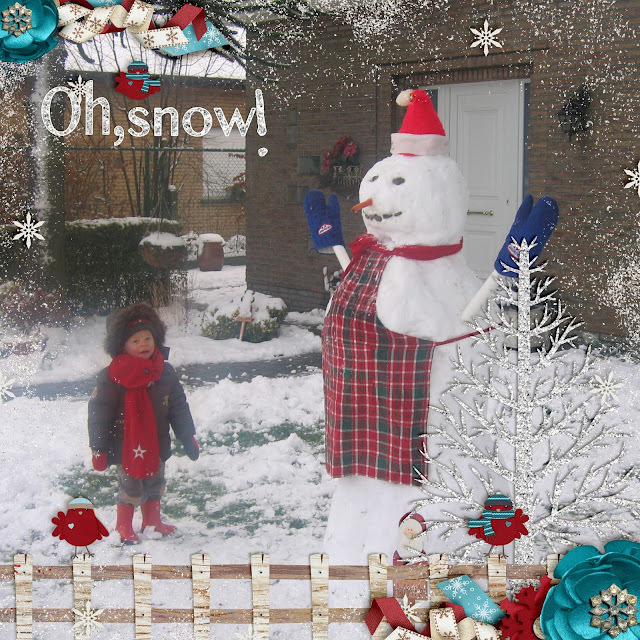 All I did was plop in a frame, mimicked a few of the elements from the cluster already designed on the page, added a few other coordinated elements and a touch of a snowy stamp from my own scrappy stash and of course, a picture with Liam and a very lame snow man. Hehehe...BOOM! Finished in minutes! 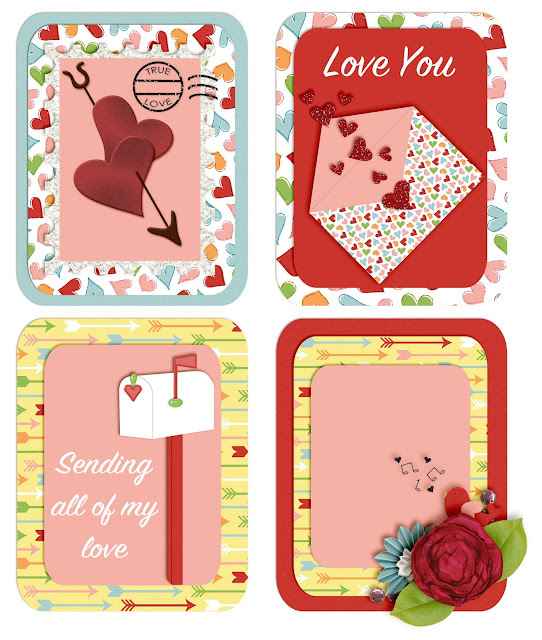 Pop over to Kit Cart's blog and grab this #freebie while you're at it! LouCee Creations also has a nifty collection. I really love that blue grey colour and this squishy, cold face is the best! This collection has such a warm, homey feel. I love it. ALL OF THE AMAZING PACKS ARE JUST $1 EACH FOR A LIMITED TIME! So, how would you like that freebie? I've designed an overlay for you. 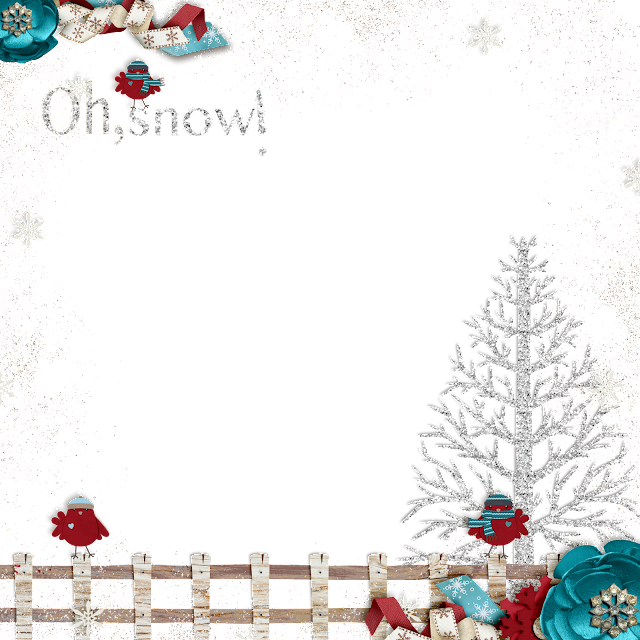 The birdies are from my Commercial Use stash, along with the tree, fence and flakes. All of the rest is from The Kit Cart Designs' Winter's Frost Collection. This is in png format. All you have to do is right click and download. Just put a picture behind the overlay and you're set. See! Remember that all of our freebies are for PERSONAL USE ONLY. They are not to be resold or claimed as your own. Wow! That was one heck of a spectacle, eh?! Thanks so much for joining us here, at The Cherry. I hope you also join us at the Studio to shop around and play along with the monthly challenges. See you there! Today's blog is totally kick'n! We're throwing out an awesome tutorial, beautiful inspiration, some helpful tips to improve or enhance your projects as well as announcing two chances to win a free template. Sometimes a kit, whether digital or traditional, speaks to you. Alexis Design Studio kit's always do that to me. A kit is really, really good when you scroll through those lovelies and are immediately inspired. This time I had a template I needed to work with and knew exactly what kit would fit the bill for it. The template is a fabulous blended cluster of awesomeness from PHOTOcowgirl and a stunning collection from Alexis Design Studio. Keep on reading to see how we altered the template, to view our nifty tutorial on transferring shadows in a template with PSE and find out how you can win templates like this one so you can apply our tips. 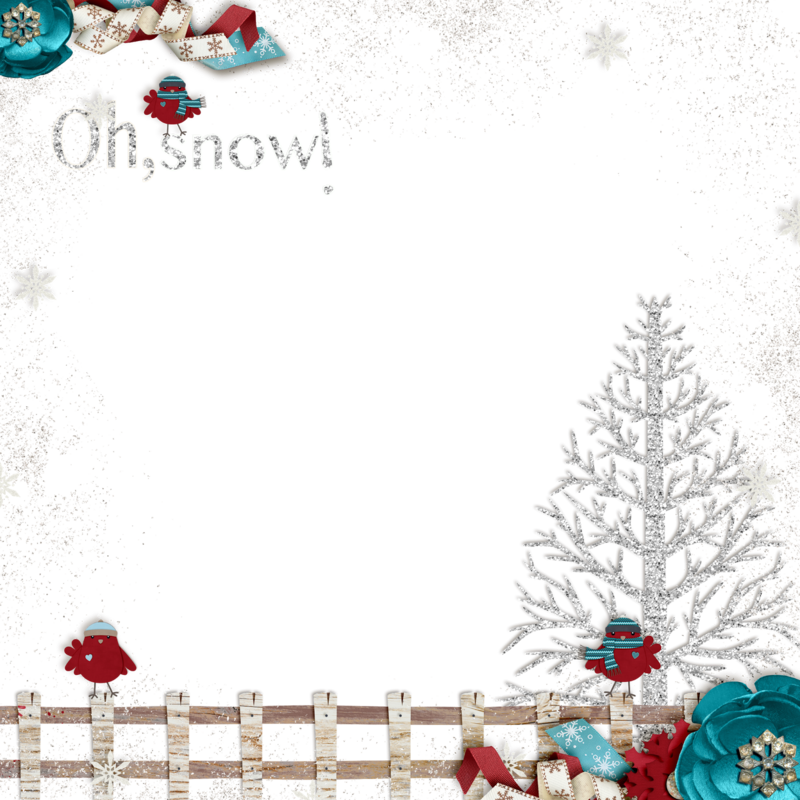 Below, is PHOTOcowgirl's new blended template. It features two magnificent blends in the background, multiple photos and one amazing cluster. Use the blends to show off your favourite papers or backgrounds or a photo, like I did. Let's get started with the tutorial. My goodness, gracious! I've been playing with templates for at least a year and I had no idea how to get the designer's drop shadow on my layout. Thanks to a fellow scrappy sister and me being brave enough to ask, I now know how to do it. Yes, it's a bit of another forehead slap for this blond mama. Hehehe...It is so easy a couple of clicks and you're set. I took the template, enlarged the entire thing, just slightly, rotated it and enlarged the photo spots a tad with some slight repositioning. If you know The Cherry, we typically tear apart a template, but for this one, we really stuck with it in a near literal fashion. As you can see, we put in those blends with paper and a photo, backed up the cluster with some glitter and doilies and the next step is replacing Amanda's elements with our own. How do we do it and keep those awesome shadows? Hover over your layers and right click on the ellie you want to replace. Then choose, Copy Layer Style. Delete the element and insert the one you want. It will automatically come right in the layer you need, unless you want to change it, of course. Delete by right clicking and choosing Delete Layer or use your back space key. High light your newly inserted element, hover back over your layers field, right click on that element and choose, Paste Layer Style. This will not work if you hover over your element in your layout and not in the layers section. That's it! So easy, right? As a template designer myself, we take a lot of time to get those shadows just right and what an awesome tool to know if you're not good at shadowing or if you just want to save time. If you do not like the shadow or you want to make adjustments, you'll have to click on the element, and Delete Layer Style, then insert your own as usual. 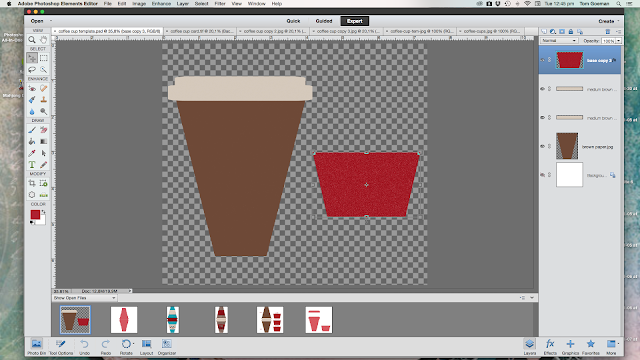 Without deleting the layer style, you'll move the entire templates shadow and ya don't want that. 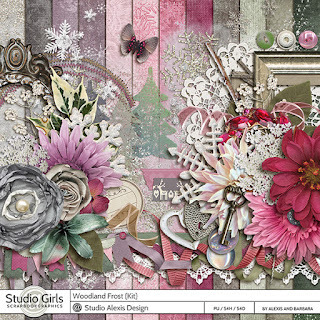 Here's a peek at this absolutely gorgeous kit from Alexis Design Studio, Woodland Frost. 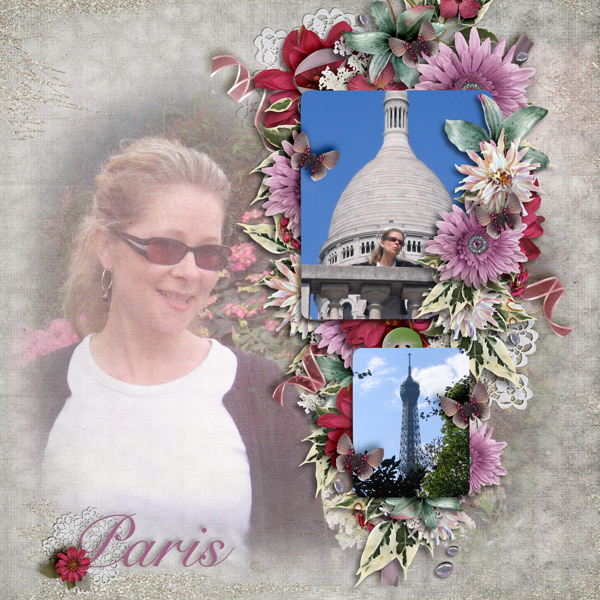 PHOTOcowgirl will be giving away her new, free templates to one lucky commenter. To win Amanda's templates, leave a comment at this link. If you'd like to try your hand at a layered template with our directions on how to get the designer's shadowing, then try it out on any of our free templates or on our newest one, below. 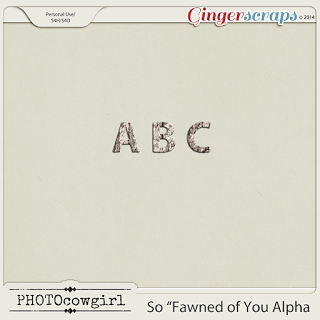 PHOTOcowgirl has this free alpha on her blog. Click on the preview to get there. Click on this preview to get the download. Leave us a thank you if you grab it. That's a wrap! 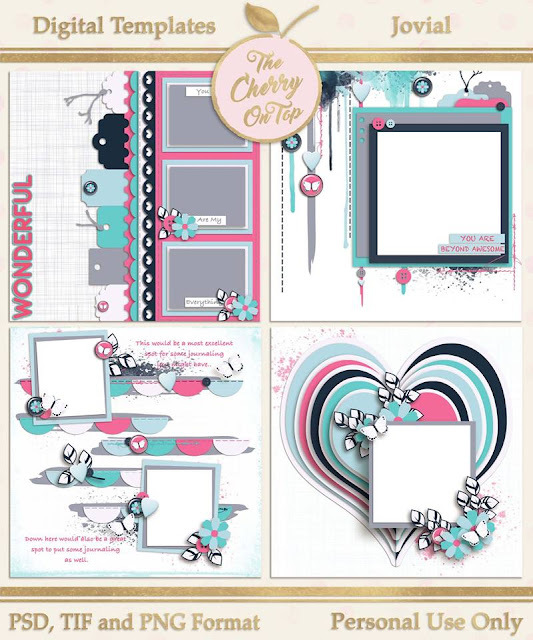 We hope you liked the blog, the tutorial, freebie,inspiration and we'll cross our fingers that you'll be the lucky winner of Amanda's templates. Getting scrappy and hybrid, again. 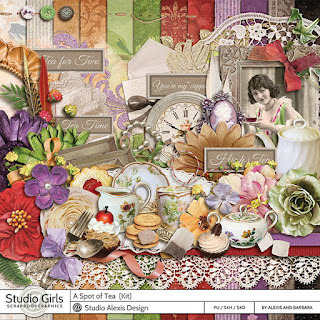 Also looking at more gorgeous collections from Alexis Design Studio, First Coffee and Spot of Tea. I've got inspiration, previews, a free hybrid, free template and a tutorial on how to put it all together. I tried sticking with hybrids on Saturday's, but they are getting backed up! Hehehe...There will be another hybrid on Saturday, too. So, come back and see what we've got lined up. Just look at these fabulous colours. 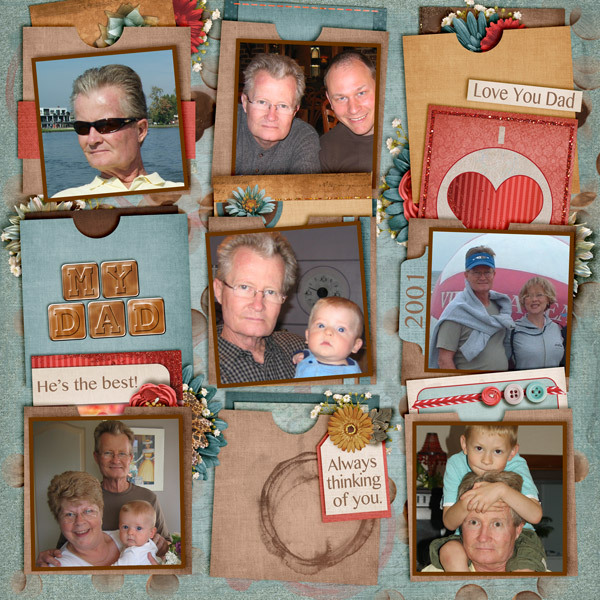 I felt a bit of a manly touch with this kit and scrapped up some sweet pictures of my father. I wasn't sure about this template matched up with Alexis's kits, but I thought it might be a challenge. I wasn't thrilled with the look, but kept adding and adding, as I often advise when you're not pleased with a layout and thought the end result was pretty good. Once you've put hours into a layout, it's hard to just delete it. This is a preview of the kit, but there is an entire collection to behold and they have it at a reduced price as well. Find it by clicking on the preview. I designed these lovely tea bag envelopes using my template. 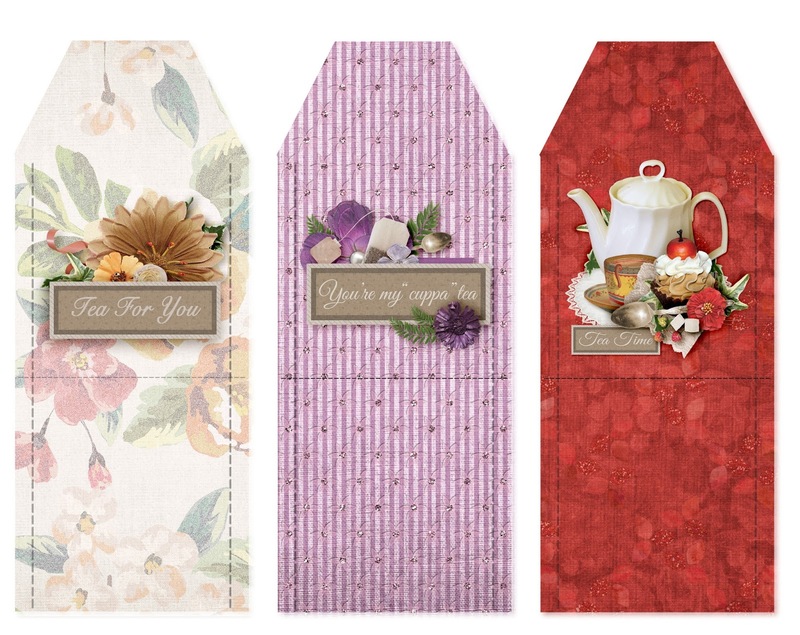 If you would like to download these tea envelopes, simply right click and save to your downloads. Scroll further to see the tutorial. This is the fabulous kit, Spot of Tea. It's a collection of beauty and you can find it at a discount. Click on the preview to see more. 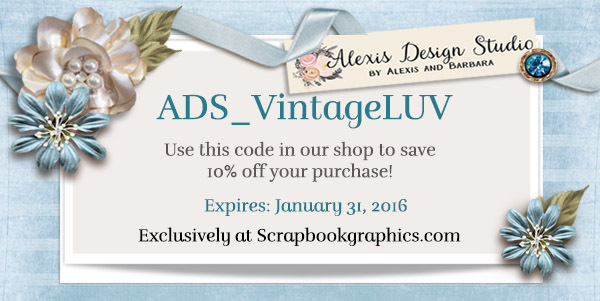 Check out thees lovelies when you buy from Alexis Design Studio. You get them free depending your purchase. And here's a little insentive for you via means of a coupon. Print out your envelopes, cut them and fold where indicated. It's THAT easy! These envelopes are designed to hold the smaller tea bags, but of course you can increase the size in a software program or even the program in your printer. I used these bigger bags of tea the last time I did this project. Just cut as close as you can or take the bag out of the original wrapping and it put it in the new if you don't want to resize the envelopes. Another idea is to make your own tea bags. I do this most of the time. You can purchase empty tea bags and fill them with your favourite tea or that of the recipient . This Ginger Love is all of the rage. Consider that as a stuffer for something different. It's really great. Here they are all ready to go. That's part of my antique set of cream and sugar I got from my hubby on our first Valentine's together. This is a neat, custom type of gift to give. Head to the thrift store and buy a neat tea cup and saucer if you can find both, fill it with the tea of their liking and consider cellophane wrapping with a fancy bow and tag to finish it off. That gift would look really awesome and you wouldn't even have to spend 5 bucks! If you like the concept, but not these particular envelopes go to our other blog here, where you can download the free template and make them your very own. Keep in mind our free stuff is for PERSONAL USE ONLY. Thanks for joining us today. Make sure ya do it, again! Take a peep at our other blog posts all in one spot by visiting our Pinterest Boards such as, The Cherry On Top's Freebies and Autism. You could also scroll back to the top and look to the right for our most recent posts. You'll find a lot of free stuff or just grab cup of jo, put up your feet and scroll through our blog.